A creamy avocado-cilantro white bean dip made easy in the blender. The perfect healthy snack dip! If you are not a fan of chickpeas, this recipe is going to make you super excited! I’m probably in the 1% of all people here, but I really dislike hummus. (Can we still be friends?!) I wish I liked it because the flavors always seem so enticing (roasted red pepper, I’m talking about you!) and it’s a super healthy snack. I’ve come to discover it’s not so much hummus I have a dislike for, but actually chickpeas. So the fact that hummus is mainly chickpeas is perhaps why I have an aversion to it. So, I wanted to test that theory. I decided it would be fun to try and make a hummus-like dip, but with a different kind of bean. I tried white cannellini beans in this dip and let me tell you, it’s crazy good. I’ve eaten this dip straight for days now! PLUS it’s very easy to make. The ingredients just get blended together until smooth! Then into the fridge it goes to get chilled and allow the flavors to deepen/meld with each other. The flavors in this dip are pretty adaptable to personal preference — you can always add smaller amounts of some of the ingredients (such as jalapeños or the cilantro) and increase them to your personal preference. These chips are good wholesome snacks that do not skimp in the flavor department. It’s pretty amazing how few ingredients are listed on the back of the bag which illustrates just how delicious simple and real ingredients taste. Dipping ingredients: Food Should Taste Good Multigrain Tortilla Chips or Sweet Potato Tortilla Chips, Fresh veggies such as: sweet bell peppers, celery, carrots, cucumber, etc. Rinse and thoroughly dry the cannellini beans. Cut the avocado in half, remove the pit, and coarsely chop. Mix the avocado pieces with the lemon juice. In a large blender or food processor, combine the beans, avocado + lemon juice, cilantro, balsamic vinegar, olive oil, salt and pepper, and jalapeños if desired. (It adds some good heat - if you are worried, leave it out or add it in slowly - you can increase or decrease the amount depending on personal preference). Pulse until the mixture is completely smooth scraping down the sides and stirring as needed. You want the dip to be as smooth as possible. Taste test and increase cilantro, salt, or pepper as desired. Transfer mixture into an airtight container and place in the fridge for at least 30 minutes. This allows the flavors to fully meld and to get the dip chilled. Serve with chopped veggies and Food Should Taste Good Tortilla Chips. Return any leftovers to the fridge. *Cook time refers to chilling time. I’m definitely a hummus fan but I love white beans just as much! This dip sounds completely fantastic Chelsea! This sounds so delicious!! Sometimes, too many chickpeas can give me a stomach ache, so it’s nice to have an alternative like this! Yum! 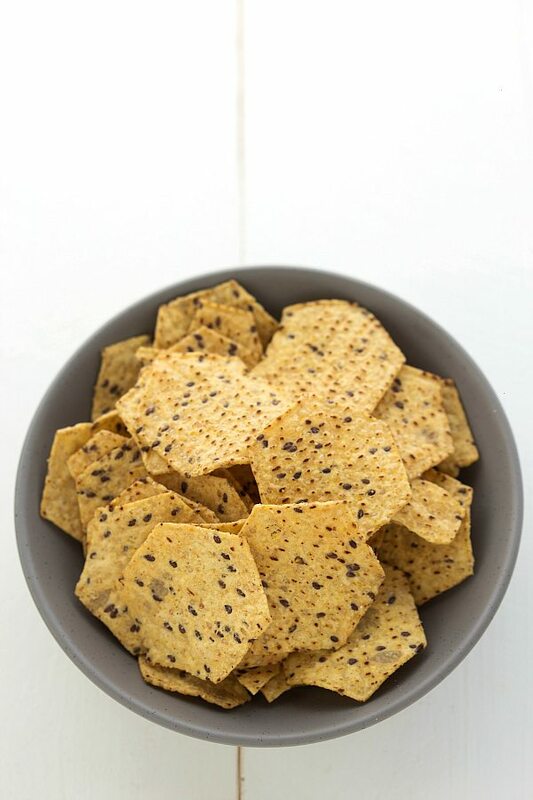 We JUST devoured one of those bags of sweet potato chips from Food Should Taste Good! Like, in ONE day! They are so good! I bet they are extra delicious with this dip. I am not CRAZY for chickpeas either, so I love this! Pinned! I love this idea, Chelsea! I’m a HUGE avocado fan so this dip sounds just PERFECT for me! I love those chips, too, I could eat a whole bag in one sitting myself! I absolutely LOVE hummus, but this dip sounds fantastic too! I love that you use white beans and avocado. I definitely want to try this! This honestly couldn’t be simpler. I can get on board with anythinggggg avocado–pinning! yum, yum and yum! I love bean dips – they’re so full of protein and sometimes I do need a break from hummus! Pinning – thanks Chelsea. YES! You’ve hit a winner here- Not the biggest chickpea fan either but white beans and well..avocado? YES. This sounds delish! I’m an absolute cilantro freak, so this is right up my alley. Thanks for sharing! Pinned! pinned! totally gotta try this recipe 😉 I love new kinds of dips and this one with avocado sounds insanly good! Such an easy and lovely dip! I love the twist of this dip, Chelsea! I do love hummus, but using white beans and avocados sounds delicious. Gorgeous pictures, too! I always make white bean dip, but usually with caramelized onions and tomato sauce, your sounds very good, and as an avocado lover, I must try it asap!! Well I guess I can’t speak to you anymore since you don’t love hummus…kidding! I am an equal opportunity lover of all dips, especially if avocado is involved. This looks delicious!